Enjoy a taste of the royal treatment at The McDonald Residence, a delightful, elegant 3 bedroom apartment located within Edinburgh’s historic Old Town. Nestled amongst history-rich cobbled streets, the Scottish Parliament and the palace of Holyrood house, the home of Scottish Royal History, this stunning apartment oozes sophistication and decadent comfort. Located on the first floor, the property also features an allocated parking space in a shared garage. Sleeping up to 6 in chic style, a stay at The McDonald Residence promises to be a classy affair to remember. Understated elegance meets delicious comfort in the spacious lounge, exquisitely decorated in warm pastel hues. An enormous corner sofa beckons the whole family to nestle into fluffy cushions and enjoy a movie marathon on the flat-screen television. Curl up with a good book and a rich, decadent hot chocolate and feel thoroughly spoiled after a long day bargain-hunting in Edinburgh’s charming boutiques. 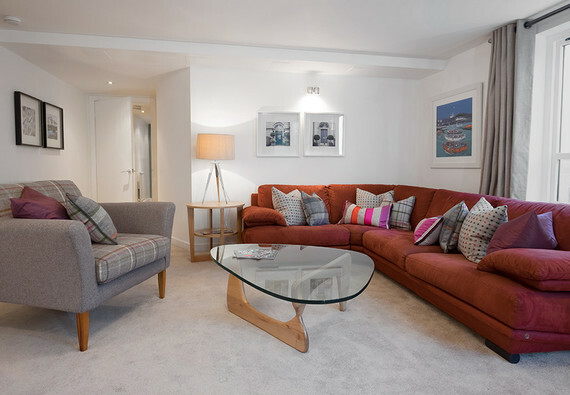 Thoughtfully and lovingly decorated with tartan highlights and gorgeous paintings of Edinburgh locales, the living room is an unadulterated haven for the weary metropolitan traveller. For those of you with the heart of a michelin-starred chef, the McDonald Residence’s dining area is the perfect stage to host your culinary masterpieces. A charming dining nook features a elegant oval dining table with plenty of room for six famished dinner guests, seated in fashionable style in one of our gorgeous high-backed, pearl-grey dining chairs. The large, open-plan living space continues into a spacious kitchen, richly decorated in subtle light woods and featuring a sleek counter-top stove and more than ample preparation space for your sous-chef to get to work! If that wasn't enough, whilst your boeuf bourguignon is bubbling away you can take a breather on the shared balcony, conveniently located just off of the kitchen. After a tiring day spent exploring the vibrant, sights, sounds and tastes of the historic Old town, let the McDonald residence lead you through to one of 3 cosy yet opulent bedrooms. The three bedrooms offer great flexibility, two with zip'n'link beds for either king size or single beds, and the third features a double bed. No matter your choice, which blissful dreams and lazy, contented mornings await you. (Please note that one of the zip'n'link options is slightly smaller than standard, and so when separated the singles are 2'6'' rather than the usual 3ft.) Each bedroom has been decorated with tangible love and care, featuring sumptuously soft, fluffy beds, splashes of colour - and of course, more delightful artwork featuring the vibrant city of Edinburgh. Lie back, relax and dream of your next Edinburgh adventure. A generous family bathroom lies just down the sumptuously carpeted hall. A chic vision of dove-grey tile, it contains a combination bath and shower, perfect for hot early-morning showers and after-dinner soaks. The surrounding area literally caters to all tastes and interests, whether you’d like to browse cashmere scarves and souvenirs on the Royal Mile, or duck out of the bustling crowd to sample some lunchtime sushi or a rich, frothy latte. Why not pat Greyfriar’s Bobby on the head as you nip along to the National History Museum of Scotland, or wander the grand halls of the Queen’s childhood home, Holyrood Palace. With a frequent, efficient bus and tram service, you won’t be short of places to see, new delights to experience, and stories to tell. Entry to the apartment is from 16:00 onwards. Check ins after 8pm will be subject to a late entry fee of £20, and check ins after 11pm are subject to a fee of £40. Earlier entry can perhaps be arranged but depends if there is a departure at your chosen apartment that day. This can be confirmed within 48 hours of arrival. If you are arriving earlier than 16:00 on your day of arrival, it is always worth contacting the property manager as they will always endeavour to give you access as soon as possible. You may be able to arrive early and leave luggage and come back however this is not guaranteed. Sleeping arrangements Two double bedrooms each with hotel style zip & link beds, third bedroom features one double bed. Parking notes One allocated parking space in shared garage. Please note that there is a height restriction with this parking facility and the parking space has a tight turning circle. The flat was well positioned and well equipped, clean and ready for us. The only negative comment on the flat would be that for 5 people one bathroom makes life difficult, even one extra loo would have made life easier. However, the lack of communication from Pawel made us wonder whether we had been scammed. It doesn’t take much to answer emails these days.